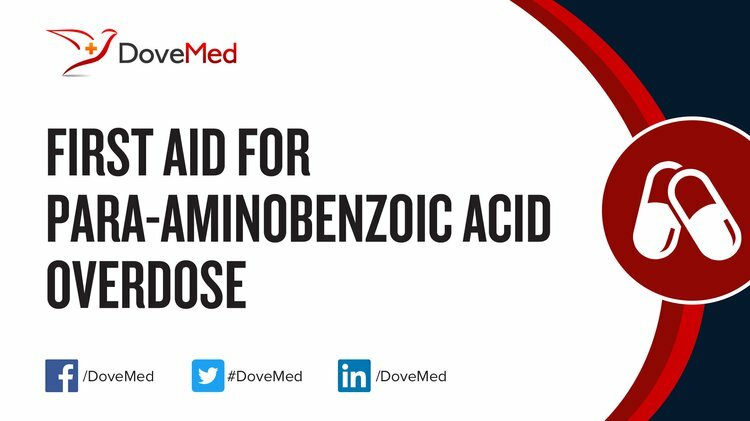 Para-Aminobenzoic Acid Overdose is the accidental or intentional intake of the compound in dosage higher than the prescribed value. What is Para-Aminobenzoic Acid Overdose? What are the Causes of Para-Aminobenzoic Acid Overdose? What are the Signs and Symptoms of Para-Aminobenzoic Acid Overdose? How is First Aid administered for Para-Aminobenzoic Acid Overdose? Who should administer First Aid for Para-Aminobenzoic Acid Overdose? First aid for Para-Aminobenzoic Acid Overdose is administered by healthcare professionals. What is the Prognosis of Para-Aminobenzoic Acid Overdose? How can Para-Aminobenzoic Acid Overdose be Prevented? Spiller, H. A., Russell, J. L., Casavant, M. J., Ho, R. Y., & Gerona, R. R. (2014). Identification of N-Hydroxy-para-aminobenzoic acid in a cyanotic child after benzocaine exposure. Clinical Toxicology, 52(9), 976-979. Sharma, R. S., Joy, R. C., Boushey, C. J., Ferruzzi, M. G., Leonov, A. P., & McCrory, M. A. (2014). Effects of para-aminobenzoic acid (PABA) form and administration mode on PABA recovery in 24-hour urine collections. Journal of the Academy of Nutrition and Dietetics, 114(3), 457-463. Millikan, L. E. (2011). Emergency Management of Environmental Skin Disorders: Heat, Cold, Ultraviolet Light Injuries. Ronni Wolf, MD, is Associate Clinical Professor and Head of the Dermatology Unit at Kaplan Medical Center, Rechovot, Israel, and the Hebrew University–Hadassah Medical School, Jerusalem, Israel. Batya B. Davidovici, MD, is Physician in the Dermatology Unit at Kaplan Medical Center, Rechovot, Israel., 293. Tanveer, M. R., & Bhatt, L. SULPHA DRUGS AND THEIR ACTION. EVERYMAN’S SCIENCE, 78. Nortje, C., Jansen van Rensburg, P., Cooke, C., & Erasmus, E. (2015). The simultaneous detection and quantification of p-aminobenzoic acid and its phase 2 biotransformation metabolites in human urine using LC–MS/MS. Bioanalysis, 7(10), 1211-1224. Minato, Y., Thiede, J. M., Kordus, S. L., McKlveen, E. J., Turman, B. J., & Baughn, A. D. (2015). Mycobacterium tuberculosis folate metabolism and the mechanistic basis for para-aminosalicylic acid susceptibility and resistance. Antimicrobial agents and chemotherapy, 59(9), 5097-5106. Cook, K. A., & Kelso, J. M. (2017). Surgery-Related Contact Dermatitis: A Review of Potential Irritants and Allergens. The Journal of Allergy and Clinical Immunology: In Practice.